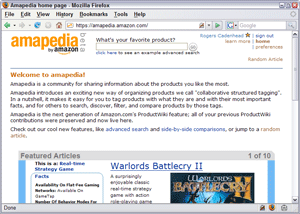 While browsing Amazon.Com this evening I noticed a reference to Amapedia, a collaborative wiki the company describes as a "community for sharing information about the products you like the most." The site's newly launched, because there's not a single mention yet on Technorati or Google Blog Search and its About page was created five days ago. Wrote large portions of production code for Amapedia, Wikipedia-inspired product website, using PHP and MySQL. Designed and implemented synonym-matching system for item types using Java and PostgreSQL. There's not much to recommend yet in the wiki's user-generated content (cash register ka-ching!). When I created a new article on the Sonicare Elite 9800 Power Toothbrush I became credited as a "Contributing Amapedian" on my user profile. I bought the $120 toothbrush because I'm overreacting to some expensive dental work I need. While receiving a crown this morning on one of my molars during a difficult 90-minute operation, my new dentist informed me that I have a "remarkably aggressive tongue." I believe I've found Amapedia early enough that I can install myself as its leader and establish the community norms. Towards this end, I'd like all Amapedians to addressed me as Amazimbo, First Among Equals. Because I am a dental chicken beyond belief (I'd rather have knee surgery! ), I've done everything possible to avoid going to dentists. To this end, I tried out a product called Uncle Harry's Tooth Powder. (And the company should hire me because I've recommended it to so many people!) I hadn't been to the dentist in 10 years, and they couldn't believe that my teeth and gums were in such good shape. Other friends that I recommended it to have told me that their dentists were amazed at how much their gums and teeth had improved over a short period of time. I can't recommend this stuff enough. Hmm, interesting, but not that surprising. Thanks for showing us our new competitor! You know Amazimbo, I don't come here enough. Best laugh of the day. I find it interesting that this part of the political blogosphere, feminists, have not harnessed these tools for realizing some of their educational goals. There is something "gendered" going on with that absence but I think there's also something about the economics of wikis that's involved in this vaccum. Which takes me to Amapedia. Do you think this will have the same momentum that their reviews had? If people can't mention their sites or gain notoriety through even an ID handle, i wonder how people are going to valuate their contribution to the site. Yet, my biggest question is how long it is going to take for people to realize they're a fine line between active engagement and sharecropping? What exactly is Amazon giving people in return for their contributions? If you can't build a reputation around your entries, are they going to give something other that is tradeable? Credits? Discounts? If there is no actual measurable return for the individual, then what's the point for the individual? I think Amazon needs to consider bribes if they want my site to grow like Wikipedia. Users are being asked to generate a lot more content these days. With all of my Wikipedia editing and Delicious linking and Flickr photographing and Digg digging, I'm already doing everything I can to keep the Web 2.0 bubble afloat and ensure that Mike Arrington doesn't have to go back to the work force. I can't commit to Amapedia without the occasional $5 coupon for overpriced electronic goods I don't need. With all due deference, O Great Amazimbo, they should have called it Amazopedia. People are going to see the word 'map' when they look at "Amapedia'. We think alike, Possum. That's exactly why I'm not Amimbo. "collaborative structured tagging"? I've read this phrase five times and I still don't know what it means. I'm pretty sure it's not going to take off, though. You can't just leave us without an explanation here. Does it have X-Men powers? I'm pretty sure it's known as "curious tongue." Oh, curious tongue! I understand now. My dentist is a tiny girl with monkey hands, and I asked her one day what was the weirdest thing that ever happened in her office, and she replied that one of her patients licked her fingers unconsciously (he said) while she worked on him. She said it was vaguely sexual-seeming but not enough to kick him out. So Rogers, tell us more about your lingual sexual harrassment. I have to admit I didn't love how Amapedia got put tied around the existing content. It seems like an add-on, rather than an integral part of Amazon's content. Here are some more comments on this topic. I have lust in my heart for you, Cadenhead. Seriously, I think you are so kewl. Now, can you make www.cruel.com come back to life? If so, I will personally brush your nasty little teeth for a month, and then floss them with a braid of my nether-hair. Oh Great and Powerful Amazibo! I am starting to jones without my Cruel. I understand how hard it can be to get a site up and running, and I sincerely promise to stop calling you retarded George Clooney if you will just please hurrythefuckup. The wikis on Amazon's product pages never seemed to draw much interest. If they had, it seems they would have populated Amapedia with some of that content, no? Someone at HQ sure has a stiffy for wikis. A wiki-stiffy?